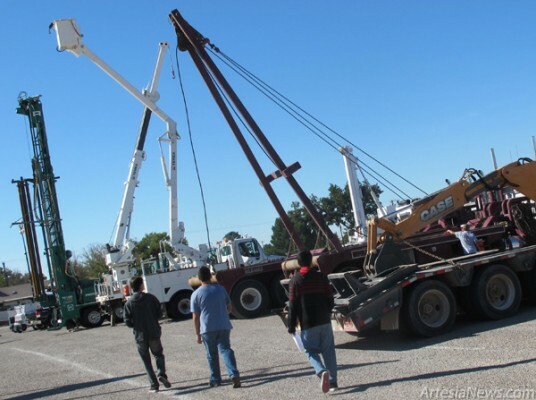 Students with New Mexico Math Engineering and Science Achievement (MESA) view oilfield equipment on display this morning at Bulldog Bowl as part of Pecos Valley Energy Week. The students were able to obtain a close-up view of the equipment, as well as talk with representatives of numerous area companies about its function in the field. Energy Week activities continue tomorrow with a 6 p.m. reception at the Ocotillo Performing Arts Center for the Tyler Green Photography Exhibit “The Field” and at 7:30 a.m. Friday at the First Baptist Church Total Life Center when geoscientist Dr. W.C. “Rusty” Riese presents a free “Energy Footprint” breakfast.